Relativity mathematical physics science doesn't come out of any Jewish or Christian Bible, does it? In fact, nothing really scientific comes out of any bible, does it? Perhaps for the Old Testament there is an attempt at trying to explain the "origin of everything", this could be admitted. And the Old Testament is as much a Book of Jewish History as it is about metaphysical ontology. The New Testament does bring forth newer concepts of ethics and human values, which in itself is something worthy for our present day. But none of these religious tracts in the final analysis has anything important to say about modern science or advanced mathematics, do they? On the other hand, forget about the Koran, rather that's all about killing or subjugating Jews, infidel and crusader Christians, with the remainder being less than worthy Hindus, Buddhists, atheists and such. Also as an added insult to the mother religion of Islam and Christianity, Islamic adherents of the Koran speak of Jews as pigs and apes [ see Wafa Sultan: mpg4 or flash movie; also see Geert Wilders Fitna movie: mov or flash and 'Geert Wilders verdict: Victory for Free Speech': mpg4 or flash movie ]; although the supreme ignominy for propagating historic anti - semitism does indeed belong to The Roman Catholic Church and The Evangelical Lutheran Church. Finally as regards so-called "Crusader Christians", it was the forces of Mohammed's Islam which truly began the first crusades against Christian Europe beginning in the 650s A.D. or thereabouts. It was only until Saturday, October 11th, 732 A.D. when the grandson of Charlemagne ( Father of Europe, Greatest King of Europe ), Charles ( "The Hammer" ) Martel, and his Frankish soldiers began the long and bloody turnabout at Poitiers, France, at the Battle of Tours ( aka Battle of Poitiers ) when the Islamic Saracen army of mounted Arabs and Berbers were roundly defeated! Other immediate victories by Charles ( "The Hammer" ) Martel against Islamic Saracens occurred at Avignon ( 737 A.D. ) and Corbière ( 738 A.D. ). And notwithstanding the current battles against the darker forces of Islam presently raging today in the East, it was at the Siege of Vienna in 1529 by the moslem Turks under Sultan Suleiman I, in an attempt to capture the Christian city of Vienna, Austria, that best represented Islam's unremitting and continuing desire to conquer Christian Western Europe but who were ultimately defeated by a combined force of Austrian-German defenders that Vienna was finally saved on October 14th, 1529. Of course, before Suleiman's final retreat, he massacred his last remaining German-Austrian prisoners, something not unfamiliar in today's war with the Islamics. The last major defeat for Islam occurred at the Battle of Vienna when the combined Viennese armies of Poland-Austria-Germany pushed out the moslem Turks at the gates of Vienna on September 11th and 12th, 1683, and thereby both ended Islamic ambitions in Europe as well as augured into existence the Habsburg Dynasty. So speak no longer solely of Christian Crusaders but rather speak equally of those Islamic Crusaders who first began this 1400-year "Clash of Religions"! But why bring up religion in the context of relativity mathematics? It's because of the sordid history of Judaeo - Christian attempts at suppression of science and mathematics, although this ignominy belongs primarily with the Roman Church of Western Catholicism such as immediately upon Gregor Mendel's death in 1884, the head priest burned all of Mendel's papers in his collection on plant genetics. Nevertheless in spite of official and sanctioned Roman Catholic suppression of science and mathematics, there were notable Christian intellectuals even within the Catholic Church itself who pursued and promoted advances in mathematics, astronomy, medicine and science in general [ note: see Monsignor Georges Lemaître ( 1894 - 1966 ), Belgian Roman Catholic prelate, astronomer and relativity cosmologist in Big Bang - Glossary ]. And now imagine if the even darker forces of Islam had won at Poitiers or Vienna instead of the relatively enlightened forces of Christianity! What today would be the state of science, astronomy, mathematics, medicine, literature, and even aesthetics? Science and mathematics do not after all exist in a cultural and political vacuum, do they? I think therefore you can more than easily answer this question by yourself. 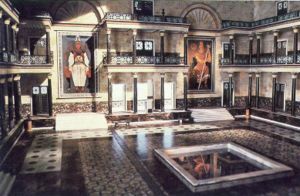 The approximate last known head of the Department of Mathematics and Philosophy, Musaeum of Alexandria, part of the Library of Alexandria, was female mathematician Hypatia of Alexandria ( circa born 350 - 370 A.D., murdered 415 A.D. by Christian Copts ), an outstandingly notable Hellene philosopher, mathematician and astronomer whose murder by fanatically enraged Christian Coptic mobs was inspired by the leading Christian Patriarch, Pope of Alexandria later canonized Saint Cyril of Alexandria no less for his expunging this brilliant non - mystical, non - Christian thinker and ecumenical teacher of Jews, Christians, foreigners and other pagans inhabiting cosmopolitan Alexandria. Hypatia's invention of an improved astrolabe and her subsequent book "Astronomical Canon", a table of star positions for navigational explorers, was subsequently in use by other intrepid sailors and explorers for the next 1,200 years, all of this in addition to her thirteen books on algebra and another eight on geometry! Her favorite exhortation to her class pupils and in public lectures was "Reserve your right to think, for even to think wrongly is better than not to think at all." Thus during the later time of Catholicism under Pope Urban III ( Milanese born as Uberto Crivelli circa 1120 - died 1187 ) and the infamous unjust house imprisonment of Galileo Galilei beginning in 1633 by Urban's personal authority given by the "Congregation of the Holy Office of the Inquisition" ( the Roman Inquisition established earlier in 1542 by Pope Paul III ), it therefore seems that in comparison to Galileo Galilei Hypatia was needlessly treated badly by Catholic authority perhaps because of her famously feminine beauty and widely acknowledged philosophical and mathematical brilliance. The ultimate demise of the Library of Alexandria and its Hellene scholarship is usually correlated with the Christian murder of Hypatia, stripped naked in the streets of Alexandria with her flesh scourged from her body by Christian hands and fingers while being dragged to her final death by burning alive. The final loss of Hypatia to scholarship and advancement of knowledge marked the beginning of the end of humanist Greek science and mathematics until it was resurrected in Europe during the Renaissance ( roughly 14th to 17th centuries ), the Age of Reason ( late 17th century ), and the Age of Enlightenment ( encompasses the Age of Reason and extends into the 18th century ), all of which the Catholic Church continued to strenuously oppose. In retrospect, Galileo Galilei got off rather easily indeed! Pope John Paul II and The Pontifical Academy of Sciences however exonerated Galileo Galilei in 1992, thus finally ending their 359 years of ignominious behaviour towards this esteemed mathematician, astronomer and scientist whom Albert Einstein termed "Galileo ... is the father of modern physics -- indeed of modern science". The burning of the Great Library of Alexandria and murder of 6+ million Jews at the instigation of Germany's Nazi - Aryan Religion are brother and sister to each other in the short timeline of history. From the murder of the littlest Jewish tailor or shoemaker to the University of Heidelberg's murdered Jewish professors who were thrown head first to their deaths from the upper balconies by other German professors and students, the world lost an enormous potential store of Jewish civilizational knowledge reviling the lost scrolls, manuscripts and books of the Great Library of Alexandria. An early cure for cancer? If Einstein himself had not escaped the grip of Catholic ( never excommunicated by the Holy See! ) Hitler, what would be the present condition of mathematical physics? At an extreme minimum, at least the potential for advances in human knowledge died at Auschwitz - Birkenau because of Germany's Nazi - Aryan Religion which in turn had its proto - Nazi origin in the exhortations of German Martin Luther ( 1483 - 1546 )'s religion to kill and burn Jews alive in their homes, businesses and barns. Philosophic Speculation: What if the present human race consisted solely of an admixture of the Classic Greeks of Antiquity and today's modern Jews of Israel? What then would be the human condition for knowledge and humane progress? In medicine? In mathematics? In the arts of literature and music? "As long as Nazi violence was unleashed only, or mainly, against the Jews, the rest of the world looked on passively and even treaties and agreements were made with the patently criminal government of the Third Reich.... The doors of Palestine were closed to Jewish immigrants, and no country could be found that would admit those forsaken people. They were left to perish like their brothers and sisters in the occupied countries. We shall never forget the heroic efforts of the small countries, of the Scandinavian, the Dutch, the Swiss nations, and of individuals in the occupied part of Europe who did all in their power to protect Jewish lives." Key Passage: "... The word God is for me nothing more than the expression and product of human weaknesses, the Bible a collection of honorable, but still primitive legends which are nevertheless pretty childish. No interpretation no matter how subtle can (for me) change this. These subtilised interpretations are highly manifold according to their nature and have almost nothing to do with the original text. For me the Jewish religion like all other religions is an incarnation of the most childish superstitions. And the Jewish people to whom I gladly belong and with whose mentality I have a deep affinity have no different quality for me than all other people. As far as my experience goes, they are also no better than other human groups, although they are protected from the worst cancers by a lack of power. Otherwise I cannot see anything 'chosen' about them." The Full Relevant Text: "... I read a great deal in the last days of your book, and thank you very much for sending it to me. What especially struck me about it was this. With regard to the factual attitude to life and to the human community we have a great deal in common. source: The translation above is an abridgment of the letter from Albert Einstein to Eric Gutkind from Princeton University in January 1954, where it had been stored in a temperature, humidity and light controlled environment, and subsequently translated from German into English by Ms. Joan Stambaugh. 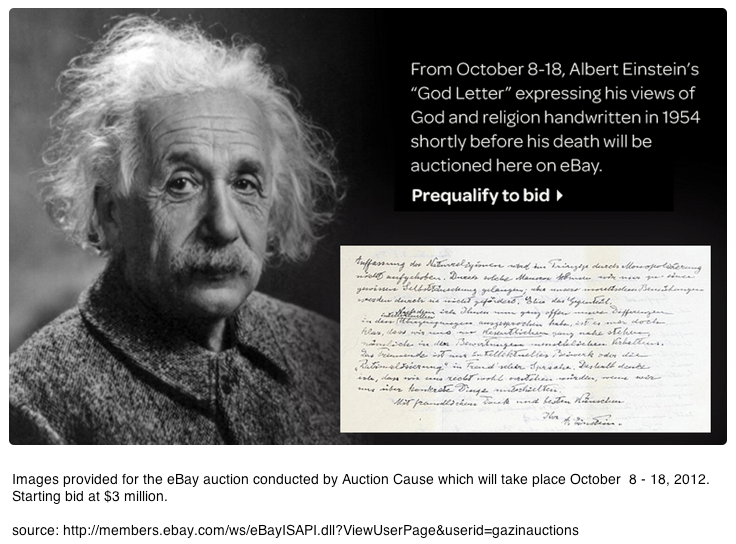 For the original Einstein "God Letter", click here.